Except for my efforts to get Wine Bottles and Broomsticks published on inkshares.com I’ve got two major works in progress at the moment. The first is the Deep Space Help Desk – I really want to knock that out, but I got stuck -I have to back up a chapter or two and take a different angle. Really, I just need a solid day to focus on that project to get it put back on the rails again. The second project, The Dark Queen of Darkness, is in slightly better shape, even if I’m finding it a slightly more difficult project to write. The Dark Queen of Darkness is an unexpected project. 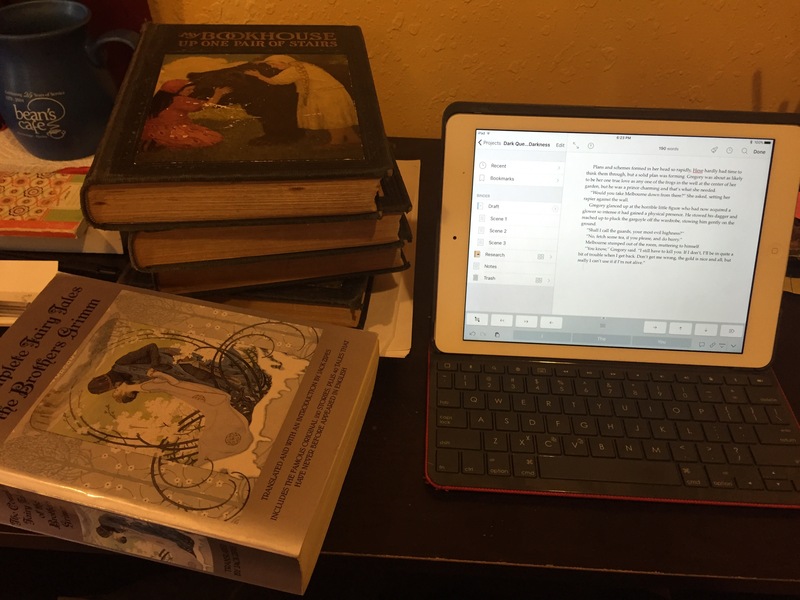 It launched as a way to test out my new iOS version of Scrivener, and also an excersize in employing tricks learned (stolen) from Terry Pratchett. Not so much as taking his words or style as incorporating parts of his approach to story telling, it appeals to me and, as they say, what doesn’t kill you or get you sued for copyright infringement will only make you stronger. In any case, the story has taken hold because it’s got a fairly clear trajectory. At least, it has if I treat it like a fairy tale, albeit a seriously broken, yet true-to-form fairy tale. With all that in mind, and some advice received after sharing the first part of the first chapter, I went back and pivoted slightly more toward a YA vibe, and starting working the fairy tale angle a little harder. Right now, I’m looking largely at Snow White, while brining in characters from other tales. This isn’t anything like a new idea, but it’s a new approach for me. I also happen to be fortunate enough to have in my possession a stack of books containing hundreds of old fairy-tales with a publication date of 1928, which I realize as I write this puts these books at nearly 90 years old – the oldest we have in the house by a considerable number of decades. The image up top features one of these books with the illustration of Snow White and Rose Red, which I only know because I read that one last night from the other book of Grimm’s Fairy Tales. In any case, the idea with this story is to make it an upside-down fairy tale that takes on the well trodden tropes and re-uses them in a slightly bent or fully ironic manner. For example, there’s the huntsman. He appears in a bunch of stories, I’m going to work him in with a lead role. Prince Charming comes in all over the place, even if not by that name. He’ll appear, after all how could a good, epic fairy tale end without a kiss by a Prince Charming? I’ll also see about writing in some dwarves, trolls, elves, wizards, and other various characters. With that, I’m off to do a bit of research and plotting. This entry was posted in fantasy novel, fiction writing research, writing and tagged author, fairy tale, fantasy author, fantasy writing, fractured fairy tale, novel, writing. Yeah! I’m looking forward to more of this. This one really is, I’m spending all of my writing time on it now because I’ve got a solid plot sketched out. Think more along the lines of – the gravity on deck 9 has been out for six months and I’ve entered 3 separate trouble tickets!